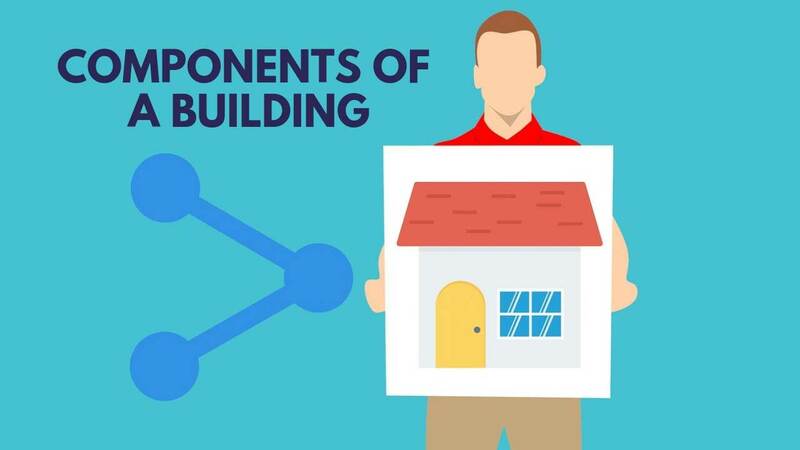 11 Basic Parts Components of a Building - You Should Know. 11 Basic Parts Components of a Building – You Should Know. In this article, You are going to learn the 11 essential parts components of a Building in details. Parts of a Building: CIVIL WORKS. 4. Damp Proof Course (D.P.C). 8. Fabrication of Doors and Windows. Water supply, drainage, and sanitation (building service). All buildings have the same components such as foundation, walls, floors, and roof. In addition, we have to decorate them with plaster, paint, etc., to make them aesthetically beautiful. These items of building works are called civil works. Water and electricity have also to be supplied to the buildings to make them habitable. These items are called building services. In this article, we will briefly examine the various components of civil works and building services. 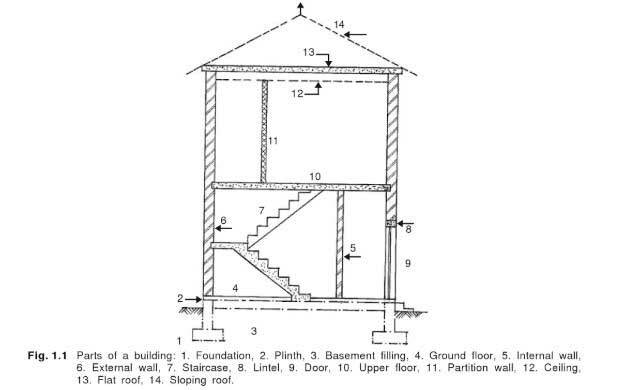 The important parts of an ordinary building are shown in Figures 1.1 and 1.2. A building can be divided into substructure (foundation) and superstructure, the plinth level being the dividing line between them. In building construction, we study how the civil works are carried out in the field after they have been planned by an architect and structurally designed by an engineer. We should be aware that many aspects are involved in the preliminary planning and design of buildings. 2. The preparation of the features to make the building attractive. Work of this nature for small buildings may be taken by non-architects also. However, the construction of a building should always be carried out under the supervision of a qualified person. We will now briefly examine the construction of the different components of a building. Foundation is a very important part of a building. All the loads of superstructure are transmitted to the foundation. A foundation engineer should know how to examine the soil profile and arrive at a suitable foundation. 5. Pier foundation (deep foundations). 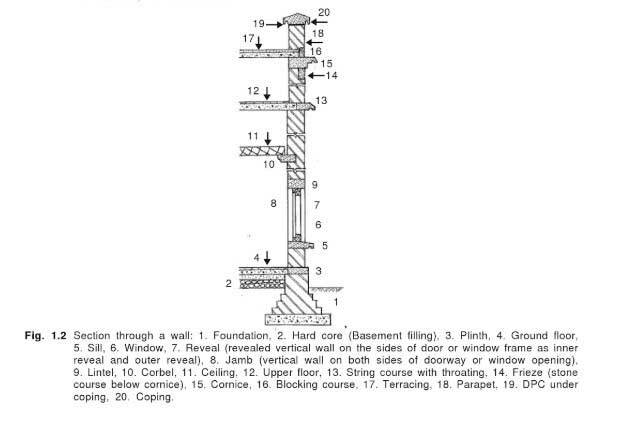 In framed construction, we use footings as the foundation for the column and the brickwork for walls starts from grade beams connecting columns. (Grade beams on under-reamed piles are also called capping beams). Read Also: Unit Weight of Building Materials [A Complete List]. The plinth is a dividing line between the substructure and superstructure. Thus, the projecting part of the wall above the ground level to the floor level is the plinth. The plinth is usually kept at least 45 cm (1.5 ft) above the general ground level of the building. It is capped by a beam called plinth beam. The provision of a plinth beam and damp-proof course at plinth level are very important in building construction. The damp proof course is a layer provided in building to prevent the entering of dampness from the ground to the building components. Walls are mostly made of masonry. It may be of brick, block-work, stonework, etc. Most of the flats and high-rise buildings are built this way. In many places in the masonry, we use arches and lintels. Floor is an important part of a building. It is the place where the inhabitants perform their most activities. It is constructed on the filling and laid over the plinth level. Floors are usually made from different types of materials, such as, timber, brick, R.C.C. Top floors are nowadays usually made of reinforced concrete. Read Also: Fineness Test of Cement; Its Apparatus, Procedure. A roof is an important part of all buildings. A roof is a layer which covers the structure from the top. It also prevents the building and inhabitants from the ill effects of the environment. Depending on the finances available and also the climatic conditions, we can have different kinds of roofs. Roofs can be sloped or flat. Many types of roofs and roofing materials are available nowadays. Openings are necessary in buildings for passages inside and outside the buildings. We also need windows for lighting and ventilation. A detailed study of doors and windows is an important part of building construction as the expenditure on this item alone can go up to 15 to 20 percent of the total cost of civil works. Traditionally, doors and windows were made of wood and hence, this work is sometimes referred to as woodwork in buildings. Other woodworks like provision of cupboards are also important, but it comes under the subject of interior decoration. Read Also: Construction Specifications; Its Types, Importance. Nowadays most buildings are made more than one storey high. Which means there should be a way to go from one storey of the building to another. Knowledge of various elements of a staircase and the construction of a simple staircase is essential to all those involved in building construction. Study of the layout and design of ornamental staircases is a special subject. Usually, vertical transportation devices like electric lifts are to be provided in buildings having more than four floors including the ground floor. We must also be familiar with these devices. The final appearance of a building depends very much on its finishing. 2. Painting of walls, woodwork, grillwork, etc. It is essential that we have a knowledge of the finishing to be used on the various materials of construction such as plaster, wood, metals, etc. Water supply, drainage, sanitation, electric supply lifts, external works, construction of cupboard, etc. are considered as items outside of civil works and are called building services. These works are considered separate from civil works and are also estimated separately. Design and details of these will be studied in public health engineering under building services. However, an elementary treatment of the subject is always included in basic building construction. Lighting and supply of electricity for various pieces of equipment used in buildings also come under building services. The supply and distribution of electricity in a building is a specialized work to be carried out by an electrical engineer. However, the basics of these works are also usually dealt with in elementary building construction. Usually, a lump sum equal to 25 to 30 percent of civil works is estimated as the probable expense for the above two items taken together. Thanks for Reading, Don’t forget to Share it. Read More: Cavity Wall Construction – its Advantages, Disadvantages.